Spreadsheets have a reputation for being cold and factual. Less often are they seen as a form of inspiration and a repository of dreams. But where was I going to start? There were too many of them, and some had to be done before others, and they all had different conditions attached, and…. 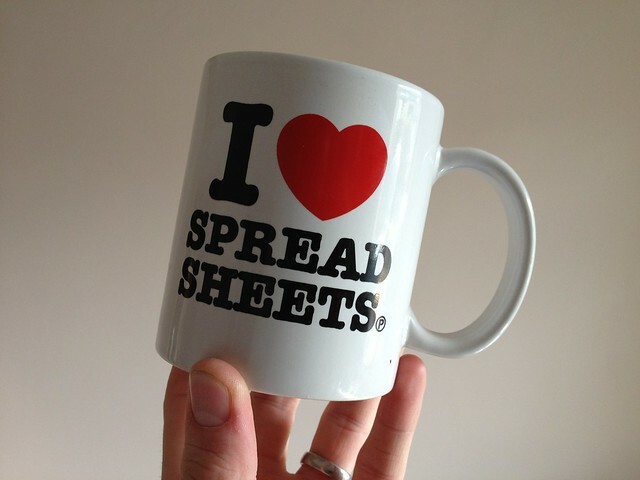 Enter the spreadsheet. The first thing to do is to list all the projects you have underway, followed by all the projects still at planning stage (Column A). To my shock, my list came to nearly 20 items. The next step is to assign them deadlines (Column B). These socks need to be finished by the intended recipient’s birthday; those curtains need to be lined before summer; this project needs to be completed before that one can be started, and so on. Some things don’t have a deadline; that’s fine. Just put down NA. Then reorder them accordingly. Column B gives you your deadlines (where applicable) but it’s Columns C and D which really tell you what to work on next. Column C tells you whether each project is portable or not. Can you take it out and about (to the theatre, on the bus, to a friend’s place), or is it a strictly stay-at-home kind of project? Obviously, if you only do one or the other sort of project, skip Column C.
Column D rates the concentration necessary for each project. A rating of 1 means you can do it while focussing on something else – TV, someone reading aloud, a conversation… Plain knitting, sewing hems or seams, and projects you’ve done a zillion times all fall into this category. A rating of 3 means that the project requires your full attention: complicated projects, cataloguing materials, or trying something you’ve never done before. A column for notes can also be handy – take photos throughout for this one; break this one down into smaller tasks; check you have all the materials before starting. Do not attempt when tired. Here be dragons. Whatever. The results? While I still have plenty of UFOs, there are fewer of them. Fourteen at last count, of which only six are actually UFOs – the others are still in the planning stages. When I add something new to the spreadsheet – for a gift, for example – it moves toward completion more quickly.